NEW: Meet Sophie & feature your Great Dane here. You've discovered an all-inclusive Great Dane dog information resource of practical first hand information! URGENT: Long time website contributor and friend NEEDS OUR HELP. Read Mary's story here. Here you'll find hundreds of Great Dane photos, an extensive information library and exclusive one-of-a-kind gear for Danes & smaller breeds! "Dogs have enriched our lives for as long as I can remember. Yet it wasn't until knowing these gentle giants that we truly experienced something extraordinary!" The character, temperament, personality and unconditional devotion of our Danes has fueled a passion that inspired this website. The contrast of intelligence, goofiness, strength and sensitivity that encompasses this breed is truly amazing. 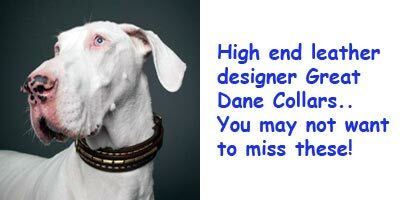 Perhaps you are considering a Great Dane as a new addition to your family? The honest first hand information we share will assure you are blessed with a true companion. Already care for a Dane? Then you as well know first hand these special GIANTS and are invited to share the love of your Great Danes by sending us stories & photos. So you're interested in learning more about Great Danes? The character, temperament, personality and unconditional devotion of our Danes has fueled a passion that inspired this website. The contrast of intelligence, goofiness, strength and sensitivity that encompasses this breed is truly amazing. When caring for Great Danes we must understand that this breed has special needs. We all will face certain problems from time to time. Concerns about nutrition, behavior, health, and training often come to mind. 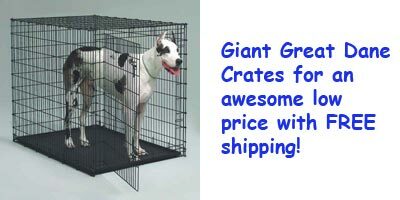 Perhaps a news search, breed specific stories, photos, or one of a kind Great Dane accessories are the reason for your visit. Maybe you're looking for rescue groups or Great Dane puppies for sale. Have you met a Great Dane in public? Have you watched from a distance at a dog park or viewed Great Dane video clips, commercials that featured a Great Dane on television or on line? Maybe you're wondering "are Great Danes right for my family?". 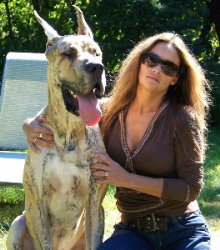 The Great Dane is an impressive creature who does best around people. Powerful, energetic and athletic yet lazy, loyal, gentle, understanding, sensitive and caring. Here's a preview of what you'll receive here! Main sections of our site are accessed by the navigation menu in the right column. Related articles to main sections are always below the main navigation menu and available via "in context" links. Your breadcrumb trail on every page help you find your way back home. Social share icons are at the bottom of every page where you can like, pin, share or vote for us at your favorite network. GREAT DANE BREED GENERAL INFO & INTRODUCTION TO GREAT DANES - Our Danes have an amazing lineage and were developed as a fearless hunters! GREAT DANE CARE, ACTIVITY & GROOMING - Guides to grooming Great Danes, Great Dane ear cropping and Great Dane activity. GREAT DANE TEMPERAMENT FOR FAMILIES WITH KIDS & SMALL PETS - Read testaments to Great Dane temperament written first hand by actual Great Dane families. YOUR NEW GREAT DANE PUPPY - You don't want a 150 pound dog doing what a Great Dane puppy does or you're in serious trouble! Learn how to train your Great Dane puppy from the very first day! Learn how a puppy crate will help you immensely with puppy house breaking and why socialization and with house rules will get your Dane off on the right paw. 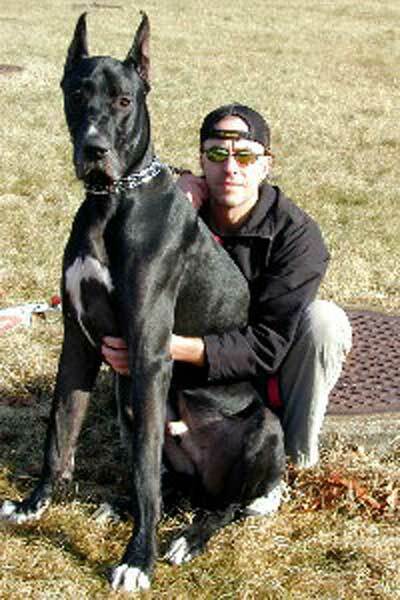 HOW TO TRAIN A GREAT DANE - We hold nothing back when it comes to training Great Danes. Receive honest information from first hand experience covering everything from Great Dane training by correction reinforcement to dog clicker training with bonus articles such as how to avoid a dog behavior problems. BLOAT THE #1 KILLER OF DANES & EMERGENCY VET COSTS - Read Bruiser's bloat story and how I almost lost him. 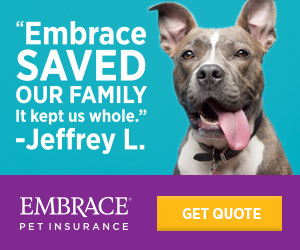 View actual invoices for emergency Vet costs and discover why I highly recommend Great Dane health insurance for our giant yet fragile breed. GREAT DANE HEALTH AND WELL BEING - Do you know about all the common Great Dane dog illnesses? We've included discussion on many common health problems including wobblers syndrome and an easy to follow wobblers home test. WHAT TO FEED A GREAT DANE INCLUDING RAW DIET CHAPTER - Informative articles on feeding Great Danes and proper nutrition are just a few clicks away. 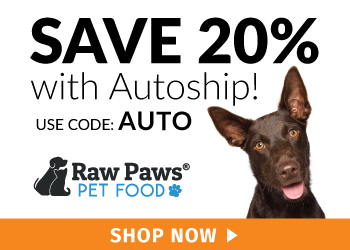 Discover premium dog food, understand dog food labels and how to choose a good dog food. Our raw dog diet section includes easy to follow instructions and a beginners guide to feeding raw to your dog. HARD TO FIND DANE SIZE DOG GEAR YOU NEED OR HAVE BEEN SEARCHING FOR - Shop our exclusive Alpenhitze Polartec dog coats, genuine 3M Scotchlite reflective dog collars & incredibly sturdy adjustable elevated dog feeders. DANE FUN INCLUDING PHOTOS, STORIES, GALLERY AND DANE OF THE MONTH - We have so much in store for you here at all about Great Danes! all about Great Danes is your all-inclusive, on line guide to living with the Great Dane dog. We're a complete information resource, filled with practical first hand information written for Great Danes by Great Dane owners. Hundreds of original articles, images & growing! There is no entitlement to Great Danes and while owning such a giant breed can seem unreasonable, you'll find in these pages that you can do it. We built this site with you in mind to shoot straight with real information about this wonderful breed. Our aim is to pay forward the good and bad with a first hand, no nonsense, on line guide to this incredible companion animal. We hope your visit is enjoyable, memorable, informative and fun. Stop by often or grab our RSS feed, we're constantly adding articles, photos and content. You can like us on Facebook or use your favorite social network below to share the love. Thank you for visiting and have a Great Day'n! Main navigation menu will bring you to major sections of our site. This main menu will posted on all major hub pages. Here's where it gets good.. We have countless articles published related to various main categories. You'll find links to these pages both "In Context" and with "Related Articles" on every main hub page. We've also included a "you are here" breadcrumb trail in case you get lost deep in our site. Breadcrumbs are scattered in the blue header above our social network icons at the bottom of every page. Speaking of social networks.. don't forget to Share, Tweet, Like, Pin It or Vote if you enjoy our site! For over 10 years our mission "To celebrate Great Danes and pay forward years of practical, first hand experience with hundreds of articles, photos & stories" still holds true. We hope you enjoy our new mobile friendly website, visit our dog training geek site for additional training help & jZ Canine for our exclusive "Dane Tough" proprietary gear. We love our Great Danes and hope your visit leaves you truly knowing these magnificent companions!